The Project: Mosaic Eggstravaganza 2011 Eggciting, Eggshausting but Eggstatic! Client: SINO Group/Project Hong Kong Kroup Group. 2011 - Sandra had just returned from attending a vendor booth at the SAMA conference in Austin Texas, USA and work had to start immediately. All systems go! Sandra visited mosaic artists in USA in Texas, Austin, Colorado, and Utah and was excited to return to this urgent project. Team OzMosaics - Sandra & David Robertson worked with Shirley Hinkley and Shirley Whitton, at OzMosaics Studio, who assisted with background detail, grouting, cutting the mesh mosaic into segments and sorting of materials, which was hugely appreciated. 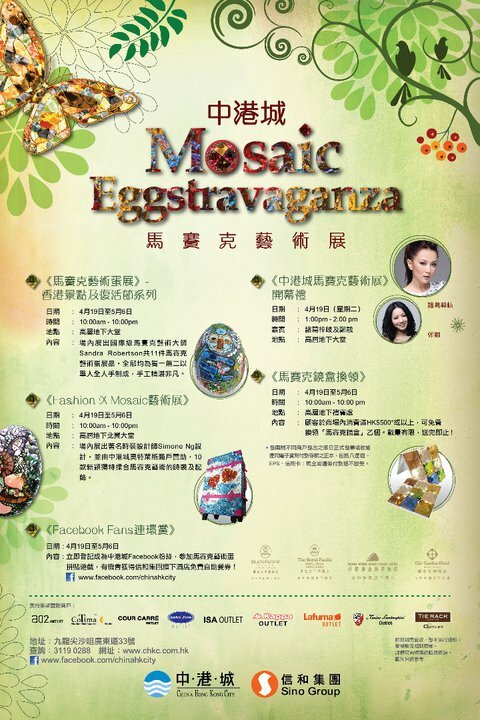 Brief: Create mosaic decorative surfaces on Easter Eggs to be showcased in Hong Kong during Easter Promotion. -Artist to design, propose light-weight substrate options, organise shipping of materials to site in Hong Kong, then fly to Hong Kong to complete the mosaics on site. -One MegaEgg over 1.6 metres to showcase mosaic Hong Kong Harbour City Views at night with recognisable buildings. -Design as much as possible with 2 weeks notice! (another artist based in USA had to relinquish the project for personal reasons, but no work had been started). -Fabricate mosaic art on fibreglass mesh in Brisbane and ship to Hong Kong. -Complete 5 smaller eggs at OzMosaics Studio and ship to arrive with us in Hong Kong featuring Australina and traditional decorated eggs. 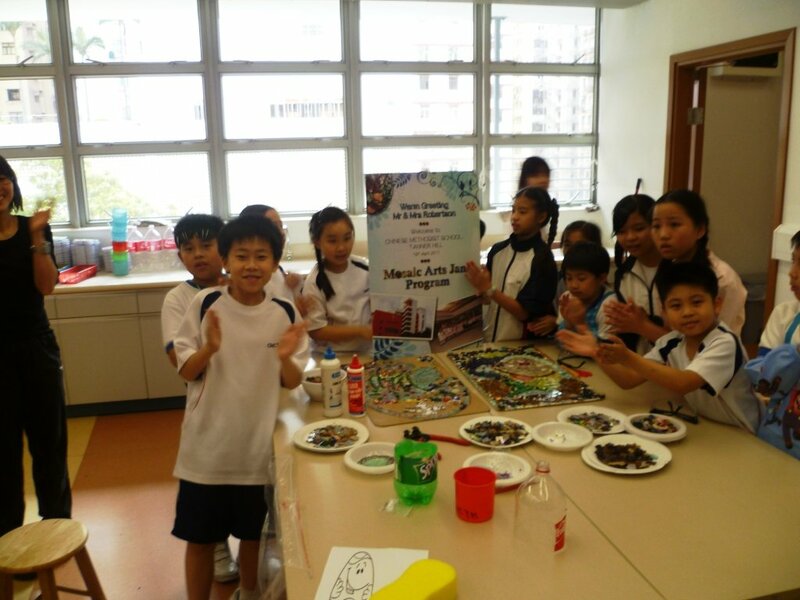 -Allow time in Hong Kong to spend a day at Hong Kong Primary School to teach mosaics and make 2 mosaics with the students. -Design and start fabrication of 5 medium eggs to feature Tourist Destinations in Hong Kong - including the Golden Buddha and cable car, the Panda at Ocean Park, The Hong Kong Bridge, Cultural Centre and more. -Organise fabrication of smaller eggs - polystryene, by laser. A Gold Coast Polystyrene company were keen to help us and sculpted the polystyrene eggs in record time. -Instruct the client on preparing/manufacturing the gigantic egg to be made in Hong Kong, ready for us to start working as soon as we landed. -Instruct client on required mosaic materials and work area to fabricate, apply, grout and install in Hong Kong. -Working almost 24-7 the deadlines were met. -Substrate - Base - polystyrene, strengthened with mosaic mesh and cement. -Tesserae - Artist's choice - smalti-vitreous mosaic tiles, 3-D elements, reused china, mirror, glass, ceramic tile and found objects. - Create attention grabbing, unique art for the Easter shopping crowd in Hong Kong for tourist and sales promotion. -Skype meetings with Cyril in Hong Kong and the client, enabled fast decisions and ongoing disucussions for the artworks in progress over 8 days in Hong Kong. -Work with another Hong Kong fashion designer and share skills for applying mosaic on fashion garments and accessories sourced from retail outlets in the huge Shopping Complex. 5 x Medium Eggs - 70 cm tall - to feature Hong Kong Tourist Attractions (Golden Buddha and cable cars, Ocean Park Panda, Cultural Centre, Clock Tower, Hong Kong bridge and Bauhemia Square. 5 x Small Eggs - featuring Australiana and traditional decorated Easter Eggs. Click the photo below to watch auto slideshow or click gallery images to move to slide/art choice. The images show the huge mosaic egg sculpture and smaller eggs in the making in Brisbane and Hong Kong. 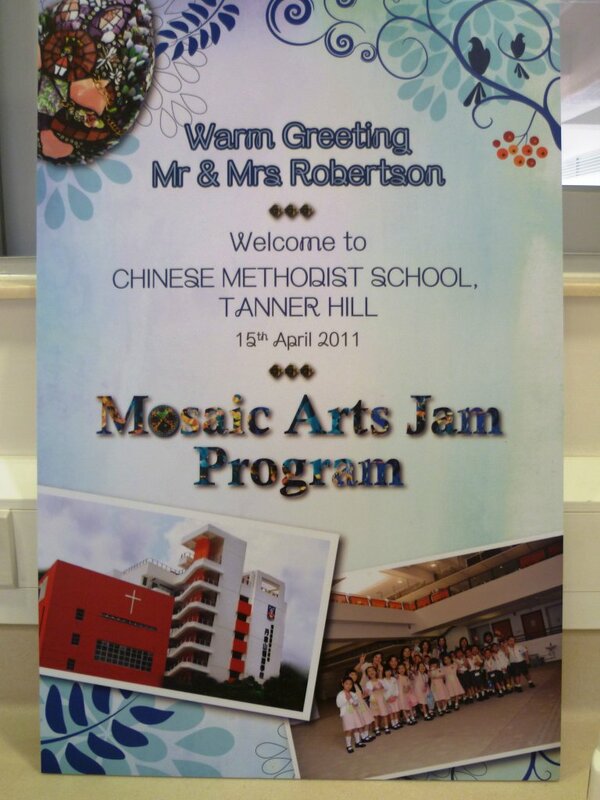 Slide show below shows Mosaic Class at Hong Kong Methodist School. I was the teacher "Miss Sandy!". A wonderful time and great memory. 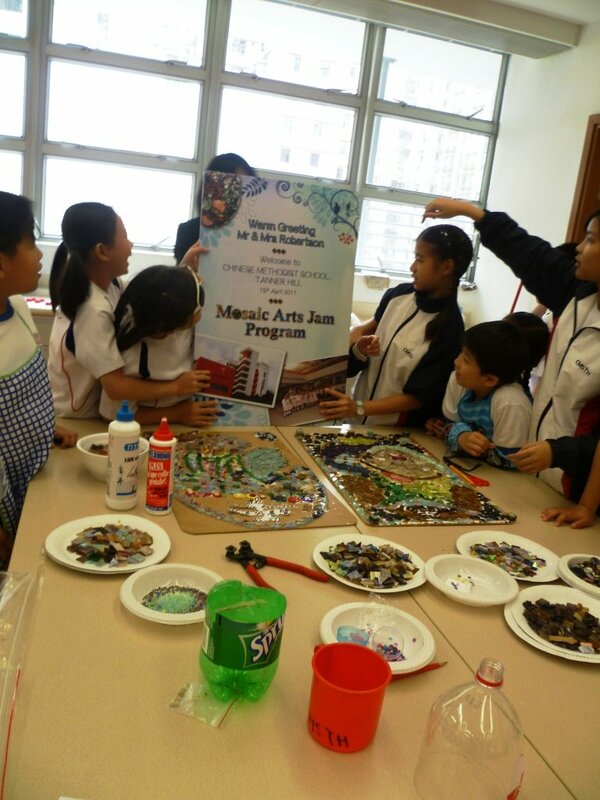 Sandra Robertson, mosaic artist and teacher visits Hong Kong School to teach mosaic art to Hong Kong school students. A fabulous time was had by all! 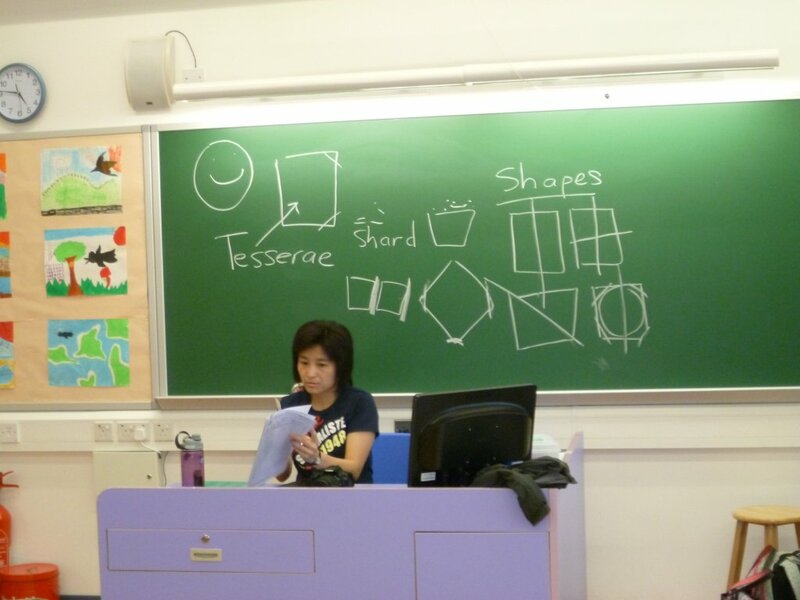 Working with school kids at Hong Kong School. Very smart, talented students who had a wonderful time with me making mosaics. It was wonderful to meet the headmistress and art teachers - an experience I will not forget. Thanks to the students for the lovely mosaics presented to me at the Exhibition opening. 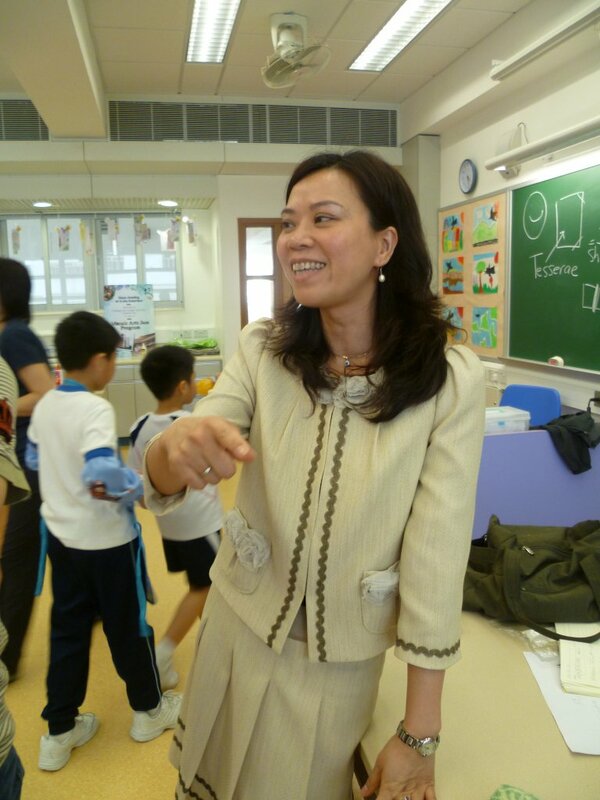 Working with school kids at Hong Kong School. Very smart, talented students who had a wonderful time with me making mosaics. It was wonderful to meet the headmistress and art teachers - an experience I will not forget. Thanks to the students for the lovely mosaics presented to me at the Exhibition opening. 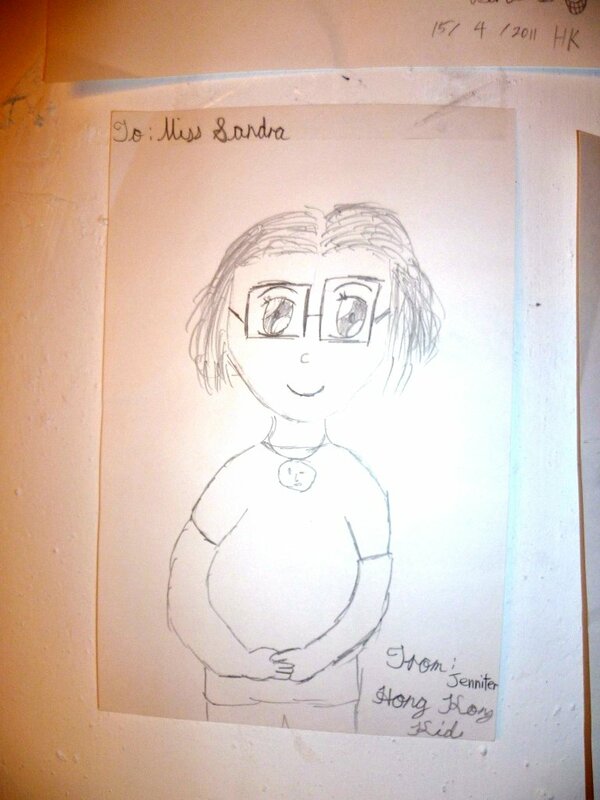 A lovey drawing I treasure here in my Brisbane Studio by one of the students. It's "miss Sandy!" Group photo session. 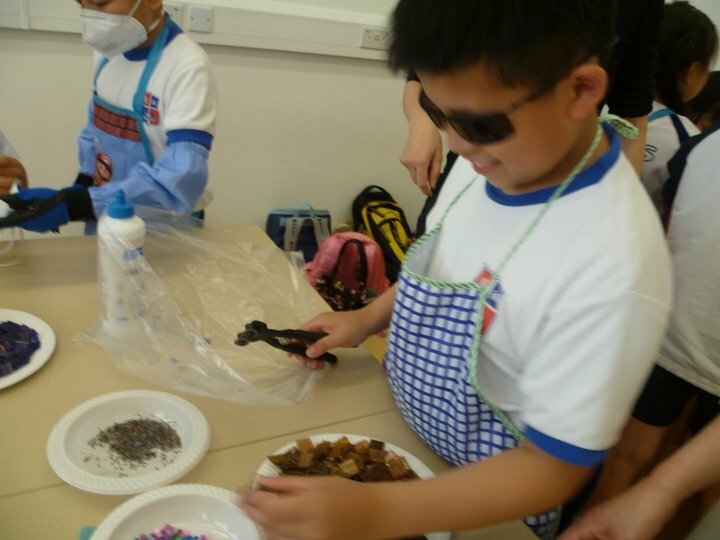 A wonderful article was printed in the Hong Kong newspapers on the student workshops. 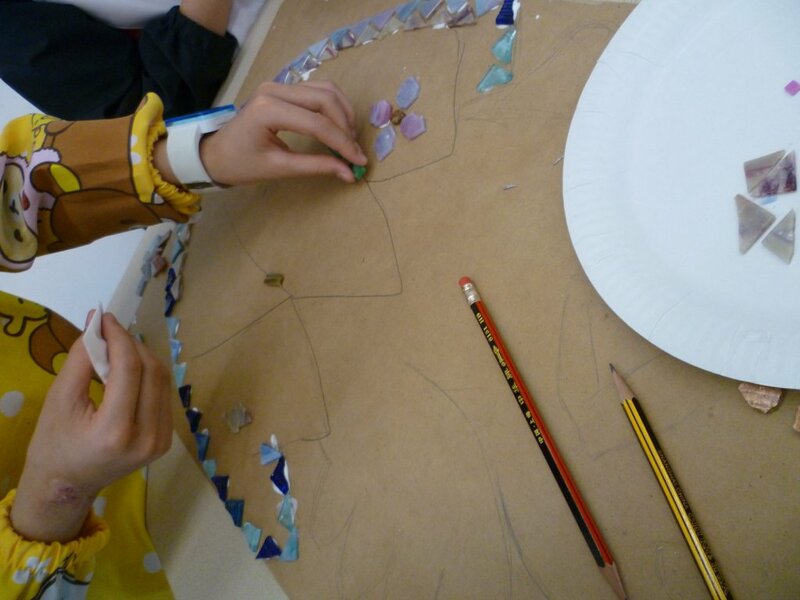 Learning, cutting, making two mosaic murals at the school. A wonderful opening showcased the exhibition with media and journalists attending in huge numbers. The exhibition ran for 3 weeks and the eggs were sold to private collectors after showcasing in a gallery in Hong Kong. Thank you so much Cyril and Sann for your kindess, generosity and friendship thoughout the project. Thank you SINO Group for this great opportunity to showcase an Australian Artist in China. Much discussion took place over emails and Skype! Could we do it in the time frame? We did - working 24-7 around the mosaic clock (Sandy is known as Mosaics 24-7!!). Finally the egg designs were approved by the client and work started. One giant feature egg, 5 medium eggs and 5 smaller eggs, featuring Australiana and traditional decorative Easter Eggs. 5 x Small Eggs - 49cm tall - feature traditional Chicken, Rabbit plus 3 Australiana designs (kangaroo, koala and emu). The opening was amazing with Media - press and tv stations all very excited about the mosaics and the promotion! A great success! The making of the eggs, tips and tricks will be shared with OzMosaics Students and the upcoming mOz-Oz online school. Sandy is always upgrading her mosaic techniques and as usual, discovered some new tips and tricks during the making of the eggs both in Brisbane and Hong Kong! 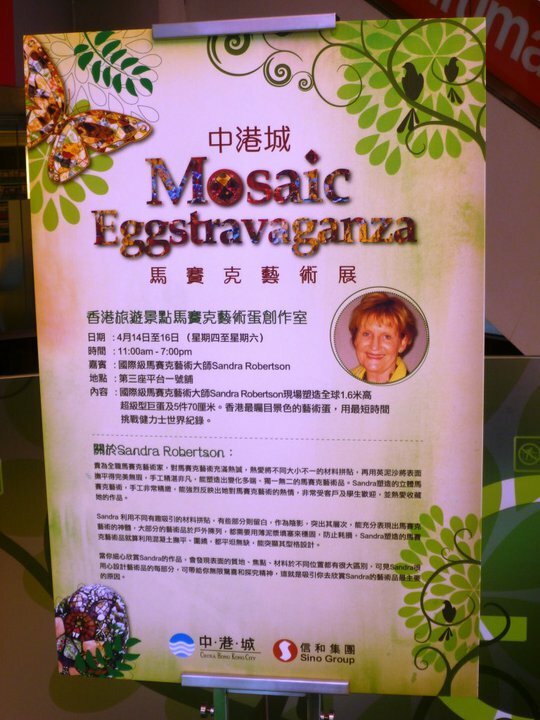 Dave & Sandy had a fantastic time in Hong Kong working on the mosaic Eggstravaganza Exhibition. 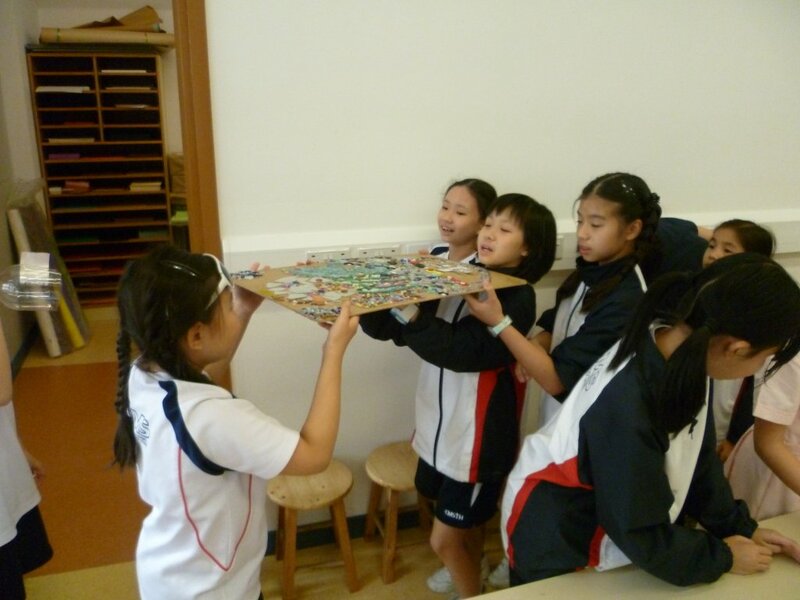 A Panda mosaic (to represent Ocean Park) was applied to a 70cm egg base. 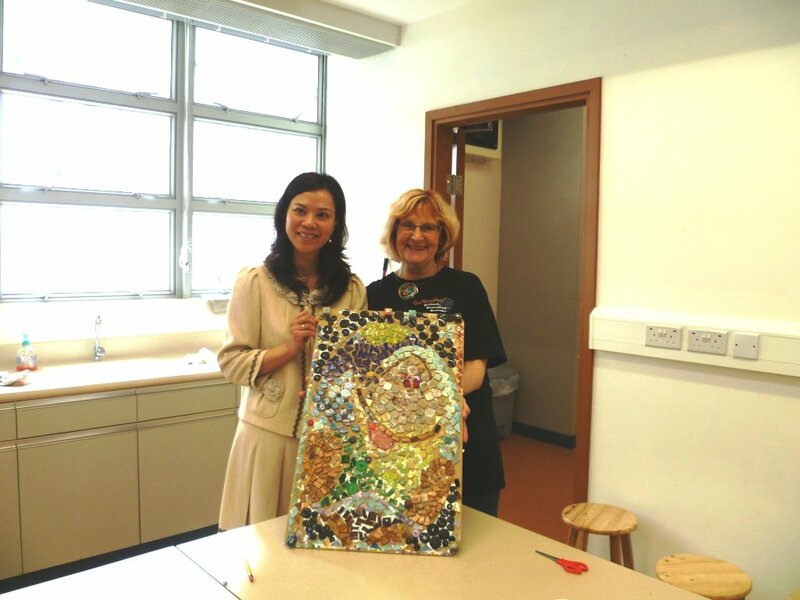 Sandy visited a Hong Kong school to demonstrate mosaics and the students enjoyed making two mosaic artworks as a team effort. They used mosaic cutters and mosaic glass tile. Sandy is always improving her modern mosaic techniques, even on the job in Hong Kong - but always keeps opus/andamento traditional methods as the mosaic core. Richard was appointed to cater to our every mosaic whim and he was amazing - a master of sourcing all things mosaic and he was keen to help cut, glue, grout, clean - thank you Richard and also TT. We were treated to a delicious lunch on a beautifil Chinese floating restaurant - the food was healthy and delicious. 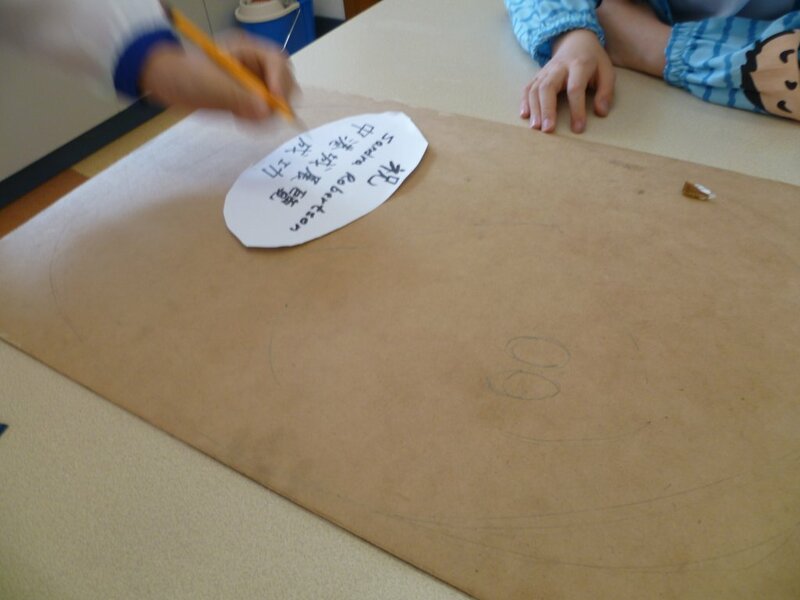 I worked on the Golden Buddha and chair lift scenic view for one of the 70 cm eggs. 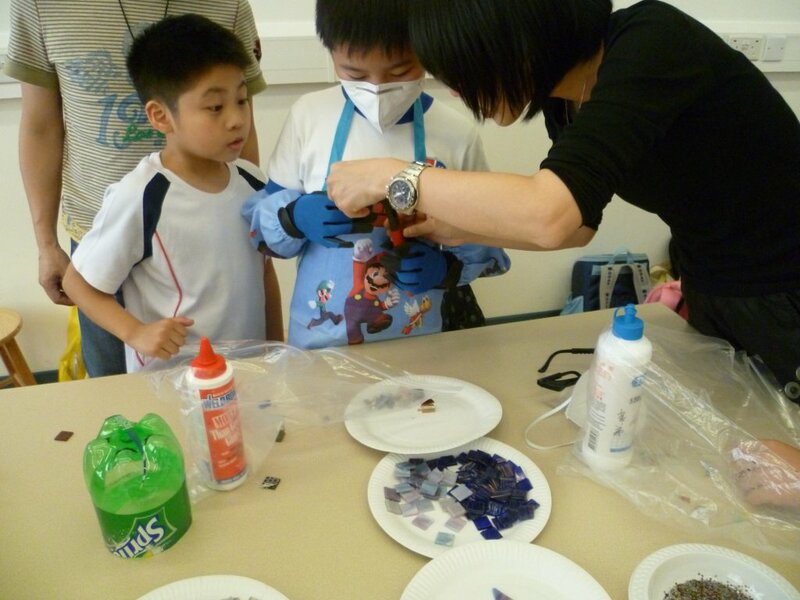 We visited a mosaic artist in Hong Kong and bought vitreous tile, stained glass, tools etc. So exciting - meeting interesting people every day and nigh added to the excitement. 5 x small 47 cm eggs from Brisbane arrived safe and sound at our huge work area in the complex. The display area for all the eggs are dispersed throughout the complex - with huge backdrops! Mosaics for other 70cm eggs include Bauhemia Square, a span of the famous bridge, clock tower etc. The largest egg measured 1.6 metres in height.